Where does your mind go when you think of 3D printed parts? Running off hard to find replacement components? Maybe spinning up a bespoke electronics enclosure? Occasionally the little boat that you can compare to the little boats of others online? All reasonable enough answers. But thanks to the work of [Matthew Wentworth], you might have a new mental image to associate with the smell of melting PLA: decorative Portuguese Azulejo tiles. As difficult as it might be to believe, the tiles you’re seeing here weren’t made on some exotic ceramic printer, but a standard Prusa i3 MK3. Well, at least they started on the 3D printer. As you might have guessed, there’s a bit more involved than that. That said, the idea is actually quite simple. The printed “tile” is just the base plate, plus the raised elements that will eventually be seen on the surface. Everything else is just a void, which naturally saves a lot on printing time and material. 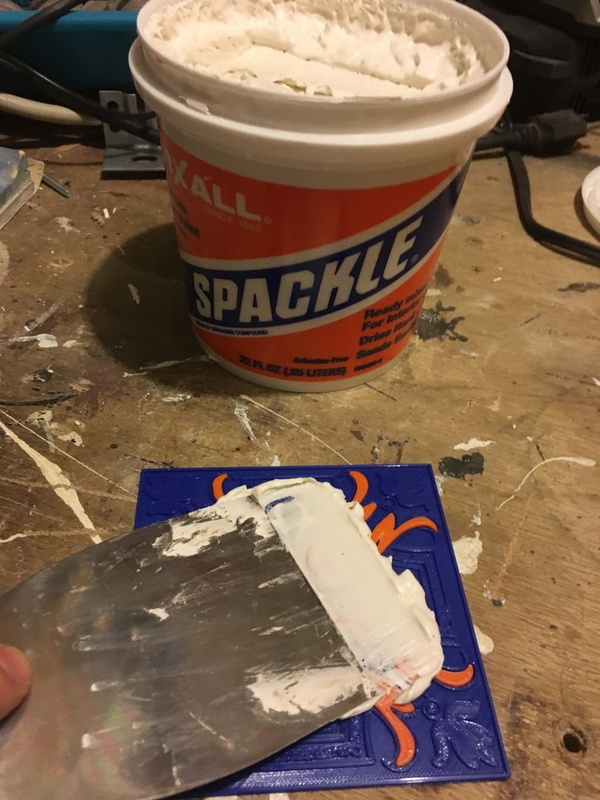 Once the print is done, premixed spackling paste is pushed into all of the open areas and the top is made as smooth as possible with a putty knife. The filled tile is then left to dry for 24 hours or so. Once it’s dried, you take the tile outside and sand the top down with a palm sander (or by hand, if you have the patience). This not only smooths out the spackle, but eventually will expose and then smooth the top parts of the print. Once everything is nice and silky, it gets sprayed with a semi-gloss clear coat to both protect it and give it that authentic looking shine. [Matthew] actually created his designs based on images of real Azulejo tiles he found online, but really any sort of image that has raised elements like this could be made to work. If anyone out there decorates their home with 3D printed Jolly Wrencher tiles, you know where to send the pictures. Interestingly, these aren’t the first tiles we’ve seen made out of plastic, but we’ve got to admit these ones would look quite a bit more appealing on your kitchen walls. A Tile is a small Bluetooth device which you can put on your keychain, for example, so that you can find your keys using an app on your phone. Each Tile’s battery life expectancy is one year and after that year you’re expected to trade it in at a discount for a new one. Right away your hacker senses are tingling and you know what’s coming. [Luis Rodriguez] had switched to Samsung SmartThings and had accumulated box of these Tiles with dead batteries. So he decided a fun project would be to put a Tile in his wife’s car to track it. Given that it’s using Bluetooth, the range isn’t great for car tracking, but the Tile’s app can network with other user’s apps to widen the search area. Since the Tile’s battery was dead, he cracked it open and soldered wires to its power terminals. He then found a handy 12 volt source in the car and added a DC to DC buck converter to step the voltage down to the Tile’s 3 volts. Finding a home for the hacked tracker was no problem for [Luis]. He was already using an ODB-II dongle for a dash cam so he tapped into the 12 V rail on that. You’ll be surprised what you can find by hacking these small tracking devices. Here’s an example of hacking of a fitness tracker with all sorts of goodies inside. Our thanks to [Maave] for tipping us off about this hack. Let’s face it, most kegerator builds go something like this: acquire old refrigerator, drill hole for tap, profit. But [GiveMeMyNickelback] recently had the opportunity to do better and he delivered. Above you can see the stylish chest freezer mod that serves up six beers on tap. Chest freezers are perfect for these builds as their top door design helps keep the cold air inside to boost the efficiency. The trick is to modify them without messing up the insulating properties of the appliance housing. [GMMN’s] approach is a common one, build a cuff to go in between the lid and the body of the freezer. He started by building a wooden box open at both the top and the bottom. Many would have stopped there but to bring the bling he tiled the sides and front of that cuff, leaving an empty spot for the shank of each tap. With that taken care of he glued insulation to the inside of the cuff, and added weather-stripping to the bottom to seal with the top of the case. He used the holes from the lid hinge brackets to attach his add-on so that the freeze can be converted back to stock without any sign of his alterations. We’d love to see a Bluetooth or Wifi add-on that monitors the beer volume in each keg. We’ve seen our fair share of AVR projects, but this one’s pretty cool. AVGA is a color video game development platform based on the Atmel AVR family of microcontrollers. As seen in the picture above, one of the AVRs that the project uses is the popular ATMega168. There were several technical hurdles to using the AVRs to run color video games; one of the most difficult problems was figuring out a way to display detailed graphics from AVRs limited onboard RAM. Eventually, the developers figured out a way to display detailed graphics using a TILE-based driver. The TILE driver works by dividing the screen into X and Y coordinates, dividing the graphics into tiles. Then, when a graphic is needed it’s addressed from a reference table that’s stored in the AVR’s onboard RAM, allowing the bitmap graphic to be loaded from a game’s ROM. Currently, the only games available for the platform are a Super Mario clone, a Pacman clone, and a Snake clone. While there are only a few games available, the platform definitely looks promising. If anything, this project serves as a great example for what off the shelf microcontrollers are capable of.